If your new to DFS (daily fantasy sports) don’t worry! Fanball has contests for beginners so you can test the waters along with other new players. In this article player’s are categorized by position, price, and then reason for being listed. Here’s a few different words you’ll be seeing often what they mean for fantasy purposes. Value is when a player reaches three times their salary or higher. A fade is a player to avoid using and typically will have a high ownership percentage. A contrarian-play is a player that won’t be used by most. A stack is the use multiple players from the same game. How do I not plug-in Matt Ryan as my stud quarterback against the Buccaneers and their god-awful secondary? Tampa Bay is giving up a league-worst 358 passing yards, 3.25 passing touchdowns, and 34.8 points per game. For context, the Buccaneers would break the NFL record in each of those categories if they kept their pace going for 12 more games. The Buccaneers go on the road this week to face Matt Ryan and the Falcons. In Ryan’s three games at home this season he’s averaging 355 passing yards and three passing touchdowns. He’s also added on a couple rushing scores in those games, giving him 12 total touchdowns at home this season. In Ryan’s last three home games against the division-rival Buccaneers have been quite successful too. He’s averaging 349 passing yards per game in those contests. Over the past three weeks quarterbacks are averaging 31 fantasy points per game against Atlanta’s banged up defense. The Falcons have also surrendered 40 points per game to opposing offenses during that time. After disappointing for most of last season, Jameis Winston was a fantasy-stud to close out 2017. Over his final five games he averaged 25 fantasy points, including 26 fantasy points against Atlanta. Tampa Bay’s defense allows nearly 35 points per game and their running backs have a combined 2.9 yards per carry with zero touchdowns, so Winston should have enough volume for both a safe-floor and a high-ceiling. At $7,800, Rivers has the fifth-highest salary at quarterback, and needs over 23 fantasy points to reach 3x-value. That’s a tough task against the Browns who lead the league with 15 forced turnovers through five games. The Browns average 1.6 interceptions per game, a big improvement compared to the 0.4 interceptions they averaged a year ago. The Browns are an elite pass defense according to Football Outsiders. They rank Cleveland’s pass defense as the second-strongest unit across the board. Philip Rivers has been phenomenal with multiple touchdowns in all five games but he’s certainly benefited from an easy schedule so far. None of the pass defenses he’s faced rank top-ten in passing touchdowns allowed, so Cleveland will be the first. Case Keenum will attempt to exact revenge on his former team and the guy who replaced him at quarterback in Los Angeles, Jared Goff. It won’t be easy against a defense allowing only 19.6 points per game, but there is reason for hope. Aqib Talib is on the I-R and Sam Shields is questionable, so Los Angeles will be down at least one cornerback, possibly two against Denver. The Rams also rank near the bottom in opponent completion percentage (24th) and have the eighth-worst sack percentage. Keenum had 51 pass attempts last week and we saw he could put up fantasy points (25) with enough volume. As a seven-point underdog, Keenum will likely need to throw it often to keep up with the Ram’s high-octane offense. There isn’t another player on Fanball more reliable than Todd Gurley. Dating back to last season, Gurley has at least 25 fantasy points in eight straight contests. He’s also a candidate to win you money any given week with his incredible upside. Gurley has 32 or more fantasy points in six of his past 20 regular-season games, or 30 percent of the time. The Rams offensive line doesn’t get mentioned as one of the elite groups, but they should according to Football Outsiders. They rate Los Angeles’s offensive line as the No. 1 run blocking unit in football. Denver’s run defense allows the second-most rushing yards to opposing backs, so Gurley should have a field day in Mile High. 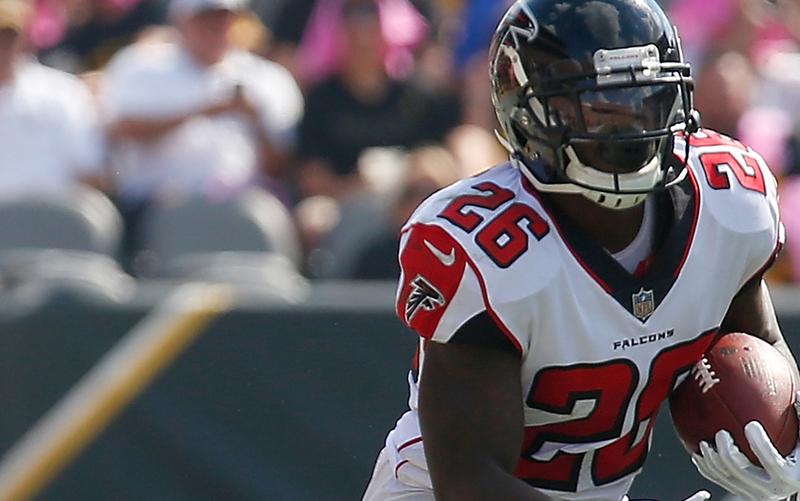 Devonta Freeman will sit out with a foot injury which makes Tevin Coleman the starting running back for the Falcons. With only 83 total yards per game, maybe Coleman is protecting himself with a big paycheck looming in free agency. Whatever the problem was, let’s hope it’s over this week against the Buccaneers. In his last two meetings with Tampa Bay, Coleman averaged 107 yards from scrimmage and a touchdown per game. The Bucs’ have been a pretty stout run defense, but they haven’t contained receiving backs all that well. They’ve given up two receiving scores to the position along with an average of seven catches for 82 yards. In case you didn’t notice, Pittsburgh has actually been good at limiting opposing running backs. They’re the No. 4 defense on Fanball vs running backs which makes them a much more difficult matchup than Mixon’s two other opponents, the 23rd-ranked Colts and the 27th-ranked Dolphins. The Steelers hold running backs to lowly 68 rushing yards per game with a 3.4 yards per carry average. Pittsburgh’s also clamping down on opposing receiving backs by holding them to just three catches for 21 yards a game. The Steelers have struggled as a pass defense so I would expect the Bengals to attack them through the air on downfield throws, leaving Mixon with a difficult path to fantasy points against this run defense. A lot has changed since Marshawn Lynch’s final game as a Seattle Seahawk back in November 2015. The original “Legion of Boom” is now completely gone and middle linebacker Bobby Wagner is the only defensive starter left from Lynch’s last season with the Seahawks. Still, I’m sure “Beast Mode” would love to unleash the “Beast Quake 2.0″ on Pete Carroll for not giving him the ball at the one-yard line. Lynch had a season-low nine carries last week, but I would expect a larger workload for “Beast Mode” this week. Seattle has allowed four rushing touchdowns over the past two weeks after pitching a shutout to opposing backfields through their first three games. To be fair, Todd Gurley ran for three of those touchdowns and they gave up one on the ground to David Johnson the week prior, so it’s not exactly Joe Schmo out there gashing them. “I’m Hooked on a Thielen” this week with Adam Thielen’s 13 targets, nine receptions, and 118 yards per game with three touchdowns over his last four and five consecutive 100-yard outings. He matches up against a Cardinal defense that looks much better than they really are. Sure they rank second-best in fantasy points allowed to opposing wide receivers, but if you dig deeper you’ll find out why they appear so good on paper. The first four opposing offenses to face the Cards’ all currently rank inside the top ten in rushing play percentage. Even further proof, Arizona leads the league with the most rushing attempts allowed with 35 a game. Thielen plays the majority of his snaps from the slot, so he should avoid Patrick Peterson who’s played just one percent of snaps as the slot corner. Keke Coutee has 41 fantasy points combined over the last two weeks and he’s averaged 11 targets, nine receptions, and 80 yards per game since bursting onto the scene. Coutee plays in the slot which gives him the best individual matchup among the Texan’s wide receivers. According to Football Outsiders the Bills have been seventh-best at defending No. 1 wide receivers, fourth-best at defending No. 2 wide receivers, but rank eighth-worst at defending No. 3 wide receivers which is where Coutee lands. With such an affordable salary of 3.6k he needs just under 11 points on Fanball to reach 3x-value, so there’s very little risk involved as well. I’m not high on the Bengals this week as you can see A.J. Green becomes the second player for Cincinnati to make it as fade. Like Joe Mixon, Green is just overpriced in a unattractive matchup and he doesn’t seem worthy of the second-largest salary for the entire slate ahead of Todd Gurley and Adam Thielen. The Steelers finally got Joe Haden back after he missed the first four weeks of the season and his return makes a huge difference for Pittsburgh’s pass defense. He shadowed Julio Jones last week and the Steelers often double-teamed Jones which forced Matt Ryan to beat them with other offensive weapons. Julio caught just 55 percent of targets thrown his way and ended up with five receptions for 62 yards. Such an effective strategy could be deployed against Green, making him a player I’m definitely avoiding. The wasteland also known as the tight end position in fantasy football has been terrible this season. It’s an extremely thin position, so normally I look to spend way up or spend way down and this week I’ll take Jared Cook who lands as the third most expensive option. He faces a Seahawks pass defense that’s allowing 14 yards per pass attempt without Earl Thomas in the lineup. Cook has two monster performances of 30 and 33 fantasy points but he’s been a major part of the offense with his 20 percent target-share with over eight targets per game so far. He has the second-most targets among tight ends in the red zone with 11 looks and he leads the position in targets inside the 10-yard line at a nine, five more than second-placed Eric Ebron and Zach Ertz. As the go-to receiving threat he is well worth his 6.7k price-tag. Super-Duper Hooper will be a popular pick this weekend. He has a fantastic matchup against the 32nd-ranked Buccaneers, plus he just put up 16.7 fantasy points last week against Pittsburgh. I’m fading him though because he has consistently been a letdown in fantasy. Over the past three seasons Hooper has never posted two double-digit fantasy outings in a row, so why should this time be any different? Hooper had eleven targets last week with Julio Jones being double-teamed and shadowed, but in the previous four games he was averaging less than four targets per game. The Texans were underwhelming to start the season, but now have the ball rolling with 10 sacks, two interceptions, three forced fumbles, and a touchdown over their last three games. Buffalo has given up the most sacks this season due to Josh Allen’s propensity to hold the ball way too long and the Bills are tied for the second-most interceptions thrown. Football Outsiders have Houston ranked as the 10th-strongest defense overall and the second-best unit at defending the running-game. That plays well against Buffalo this week, who will undoubtedly try to go to the running-game early and often, but will likely have a tough time trying to find any room against this run-stuffing Texan squad. It’s usually better to avoid defenses on the road, especially in cases like this one where the Chargers travel across the country for an early kickoff against the Browns. The Chargers are dealing with several key injuries and have five or less fantasy points in two of their past three games. They rank 21st on this slate in fantasy points scored and face the rejuvenated Cleveland offense led by Baker Mayfield that’s averaging 27 points per game since he was named starter. I would also expect the Browns to rely on their ground-game where they have been the most successful. They lead the NFL in total rushing yards and rank second-best in rushing touchdowns with eight, so opportunities for sacks and interceptions could be limited as well for Los Angeles.